Allow me for a moment to paraphrase the crows from Dumbo: “I dun gon’ seen about everythang, but I never seen an Elephant fly!” Did you know that crow’s name was Jim? Ah, to quote Family Guy: “that’s some good old-fashioned rac-”. (BEEEEEEEEEEEP. Apologies. Jake has been brought to an undisclosed location to be re-educated. Please enjoy this article from our most impartial, unbiased and most importantly, least offensive writer: Ned Neutrality). Good day to you, person currently reading these words. I am the person writing this article currently, and my name is Ned Neutrality. That is what we call a nom de plume, which means a pseudonym, which means a fake name. What I am trying to say is that my real name is not Ned Neutrality, but rather a play on words. Which means a pun or the act of punning. Please enjoy the next 25 pictures accompanied by words. Make sure to click every entry. This is 25 Things You Ain’t Never Seen Before. Or rather, 25 Pictures of various situations that do not come up very much in daily life and which may surprise you. 1. 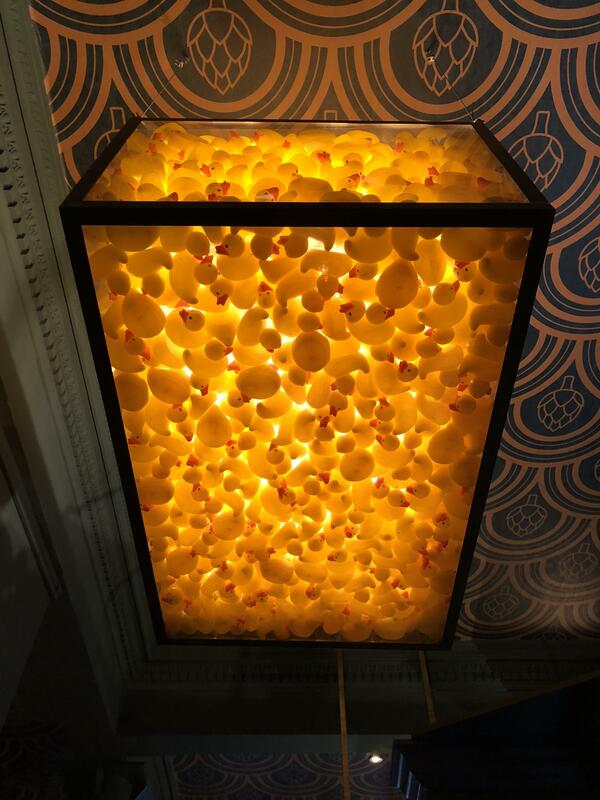 A light filled with rubber ducks. This light was in a restaurant and you do not typically see them this way. Lights, as some of you may know, are not usually filled to the brim with rubber ducks. If you have seen this before, please click on the next entry and move on. Thank you. 2. A keyboard-keyboard. This picture is supposedly amusing because they use the word “keyboard” twice, because it is a combination of two keyboards. However, this picture does not amuse me because I do not see a need for such a device. Music is too divisive, I prefer white noise. If you have seen this before, please click on the next entry and move on. Thank you. 3. A very full pipe. This is a picture of a pipe about to burst in a foreign land. Typically, you do not see pipes so engorged. They usually are straight or if they need to go around a corner, they can be bent as well. Plumbers may have seen this before, but the general population may have not. If you have seen this before, please click to the next entry and move on. Thank you. 4. Fans run by a belt. Belts have not been used in years for power, so a fan running on belts in a modern day shop may be something you have not seen before. Unless, of course, you are of an age when they used belts to power things. If you are or have seen this before, please click to the next entry and move on. Thank you. 5. Blood vessels in an eye. Had I not written what you were looking at in the title, perhaps you may or may not have thought that this person was some sort of mythical monster. I can assure you that they are not and just popped some blood vessels when they were sick. Monsters, as far as science can tell us, are not real. If you have seen this before, please click to the next entry and move on. Thank you. 6. A green pipe. I am told by some of the people I occasionally enjoy speaking with that this pipe is a reference to the Super Mario Brothers video games. I myself have never played a video game, as I find them too difficult and too divisive. I prefer white noise. If you have played the Super Mario Brothers video game or have seen this before, please click to the next entry and move on. Thank you. 7. A date that does not exist. The months that feature 31 days are January, March, May, July, August, October, and December. April is not one of those months, so April 31rst is a date which is probably made up. This is to showcase that the coupons this pizza company provides will never expire. If you have seen this before, please click to the next entry and move on. Thank you. 8. Steps over grates. These footprints over this grate are to prevent high heels from falling through the cracks. I myself have never worn high heels, as they do not typically fit my feet and I find them too divisive. I prefer bland, off-brand, colorless loafers. If you have seen this before, please click to the next entry and move on. Thank you. 9. A woman and a dog ordering drive through from a golf cart. Drive-throughs (or as they’re more typically known, Drive-Thrus) are not usually for golf carts, but rather actual cars. This woman has decided not to use a car and instead drive through the drive-through with her golf cart. Also, golf carts are not typically seen off golf courses. If you have seen this before, please click to the next entry and move on. Thank you. 10. Buying nothing. I believe that this is supposed to be a joke, although I do not find it very amusing. Why would someone ever buy nothing, especially for an outrageous price of 9.95$? It would be like throwing your money away, which is inadvisable because money is worth money. If you have seen this before, please click to the next entry and move on. Thank you. 11. Electronic UV Index. This contraption is clearly designed to let the locals know what threat the sun poses. It is my opinion that the sun is perfectly functional and should not be questioned. Sunscreen will protect you from its rays, regardless of the danger. If you have seen this before, please click to the next entry and move on. Thank you. 12. Claw machine that features cigarettes and money. Unfortunately, I am divided on this one. On one hand, claw machines are typically designed as a game for children and children should not be exposed to cigarettes, as it is illegal. On the other hand, this machine could be helpful to some smoking adults or perhaps someone who needs extra cash. Perhaps you can decide for yourself how you feel, but just in case you don’t want to, I’ll tell you how to feel: “unnerved”. If you have seen this before, please click to the next entry and move on. Thank you. 13. An onion ring in the shape of a treble clef. This one would be considered strange as onion rings are usually found in a ring shape. By some sort of mistake in the fryer, this onion ring has twisted into the shape of a treble clef, which is a musical symbol used to indicate the pitch of written notes. If you have seen this before, please click to the next entry and move on. Thank you. 14. A paint splotch in the shape of an apple. At first glance, it looks as if this paint has included not only two different colors but an apple theme as well. I can tell you confidently that this could not be further from the truth. The apple in question is just a coincidental shape that formed after some yellow paint was put into the red paint, either by accident or on purpose. Why would paint companies mix two different colors? That would be their decision as a company and I feel no ways about it. If you have seen this before, please click to the next entry and move on. Thank you. 15. The ends of the wires indicate which part of the fan you’ll be switching on. This entry is very practical, for those of you who have fans in your house. I personally keep my room at a perfect 22.5 degrees Celcius, or 72.5 degrees Fahrenheit for our readers in Bahamas, Belize, the Cayman Islands, Palau and the United States. If you have seen this before, please click to the next entry and move on. Thank you. 16. This quarter is bronze. Quarters are not typically bronze, but rather a copper-nickel combination. That is what gives them their silver appearance. This quarter has no such silver appearance and is thusly something you may have never seen. If however, you have seen this before, please click to the next entry and move on. Thank you. 17. A vault in a school. This picture is strange to the eye because it features students and a bank vault. No, this is not a field trip, but instead, the school was built in what used to be a bank. Therefore, the students will occasionally be seen with a vault. It would be impractical to build a vault in a school because I am not certain what they could conceivably use it for. Then again, I am not an educator. If you are from this school or if you have seen this before, please click on the next entry and move on. Thank you. 18. A ramp for ducks. This ramp for ducks is used by ducks to access the fountain. This is because ducks enjoy the water and depriving them of it may cause them to feel unwanted or perhaps even sad. We do not want ducks to feel sad. Ducks are our friends. If you have seen this before, please click to the next entry and move on. Thank you. 19. A curved pool table. This pool table is not typical because, as some of our billiard playing readers may exclusively know, pool tables are mostly straight. Unlike pools, which as far as I know, can be any shape that the owner desires. This idea does not apply to pool tables, which must be straight in order to play the game properly. If you have seen this before, please click to the next entry and move on. Thank you. 20. Black toilet paper. I personally have never seen black toilet paper, although I can estimate the pros and cons of it. Pro: your toilet paper is not messy after you use it. Con: Black toilet paper may be harder and more expensive to produce, as black dye needs to be added. My conclusion? Best stick to what we know, change is scary and unwanted. If you have seen this before, please click to the next entry and move on. Thank you. 21. A very large banana. Bananas, typically, are around 7-8 inches in length. Judging by the size of the person’s hand and their surroundings, this banana is larger than 7-8 inches, which as previously discussed, is larger than an average banana. However, the size of your banana does not matter, as it is all consumable matter at the end of the day. If you have seen this before, please click to the next entry and move on. Thank you. 22. A bench with wheelchair accessibility. This picture is something you may not have seen before because park benches are not usually made with people who have disabilities in mind. That can be offensive to some people with disabilities, and to most people that is distasteful. If you live in a city with these benches or have seen this before, please click to the next entry and move on. Thank you. 23. A smoking receptacle that doubles as a survey. Smoking is a habit that can cause many diseases and is generally looked down upon. However, many places struggle with the litter caused by cigarette butts, so perhaps this would be a good idea for those places. Then again, I am not a city planner, so my opinion does not matter on this subject. If you have seen this before, please click on the next entry and move on. Thank you. 24. A child holding a sign urging people not to defecate. Clearly, this child does not know that humans are required to defecate from time to time. I do not know if this is a failure of the education system or perhaps his parents never let him know but there was some sort of misstep here. If you were at that protest or if you have seen this before, please click to the next entry and move on. Thank you. 25. A spider hanging from eye drops. This picture is not typical because spiders do not belong in eye drops. Eye drops belong in eyes and spiders do not. In fact, someone may find it very painful if they were to get a spider in the eye. There are no more entries. Please click the next article and continue to read. Thank you.